Although our new island home is only a short two-hour ferry ride from Vancouver, the composition of the forests here are very different. The climate in the summer is drier allowing Arbutus, Garry oak trees, and Douglas fir trees to thrive. Earlier this winter, exploring a new trail we noticed this luminous broadleaf scattered beneath the trees. Being ignorant urbanites we thought a disease had attacked the trees and thought I would spread it by picking up samples and bringing them home to draw. Inside the warm studio they dried and shriveled up and when I brought them outside they soaked up the wet rain and uncurled, so beautiful and amazing. 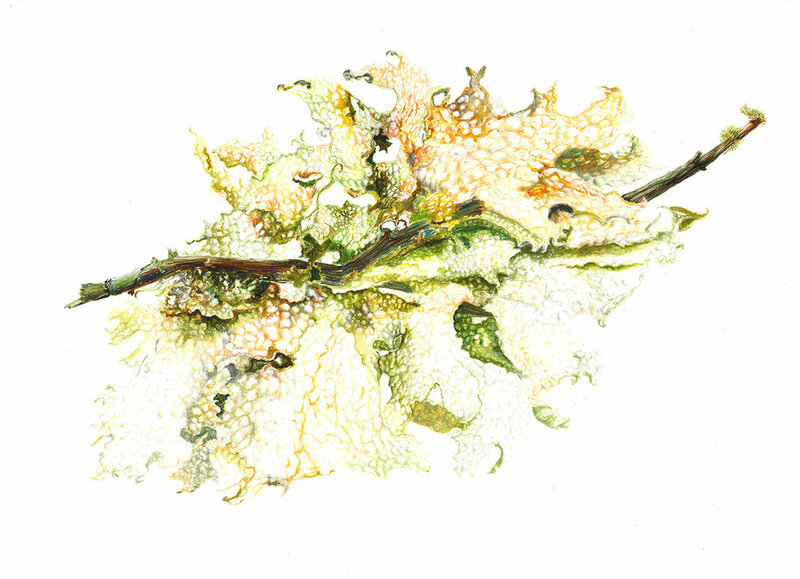 I sent images of the plants to the researchers at the Biodiversity museum at UBC in Vancouver to ask what they were and I just loved the reply, 'All three images are the Lung Lichen, Lobaria pulmonaria: evidence that the air is still fit to break on Salt Spring!' So there you have it, as my friend Joanna says, 'never assume' because, as in this case, what we saw in our ignorance as a 'disease' was, in fact, the breathing lungs of the forest. Futher research did indicate that their habitat was shrinking so I made sure to return the palnts to the same place I borrowed them from.